Do you want to start blogging with your students but don`t quite know where to start? When I first read about blogs and teachers blogging with students, I tried to set up a plan so that I could introduce blogs gradually both for students and teachers. So I have decided to share my ideas in this blog post as I know many teachers feel overwhelmed by the concept of blogging. My usual recommendation is that, as a teacher, you cannot introduce any technology tool in class unless you are familiar with it. So with that in mind, it is important that you familiarize yourself with blogs first as a user before you introduce them in class. Find a few blogs you really like and make it a habit of commenting. Set up a blog to experiment with. The main purpose of the blog could be sharing professional experiences among the teachers, but it can also be a space for more personal musings or a digital journal. The blog you are now reading was conceived with this idea in mind. Create a collection of resources for your students by posting them to a blog. Choose a lesson that would benefit from the use of technology and use a blog to present it to students. 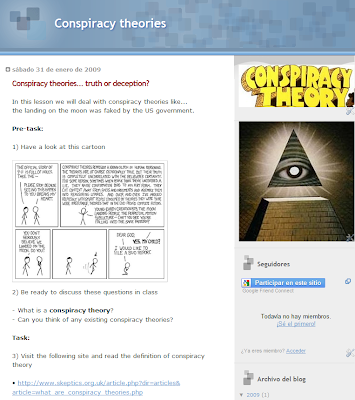 Have a look at two blog-based lessons I prepared a while ago on Friendship and ConspiracyTheories. So far, students have only accessed the blogs to see the materials, they have not been asked to comment or blog themselves. 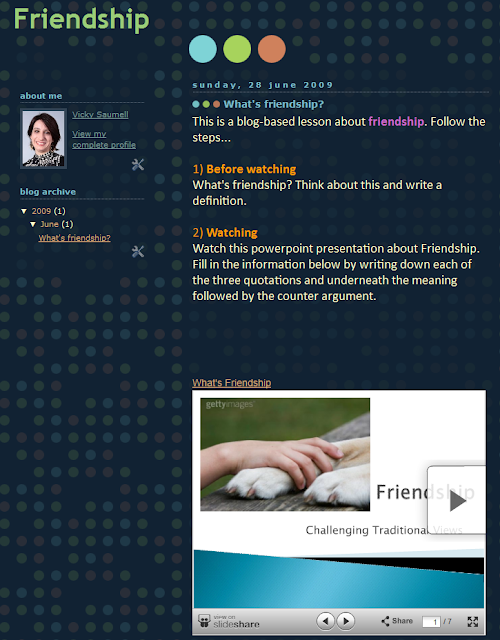 Find and interesting blog from a colleague or class and ask students to read it and comment. Alternatively you can use a blog of your own, for example the ones in steps 2 and 3, and ask students to leave comments. Now, they have moved from passive recipients of content to a bit more interactive users. Build a blog for a particular class or project and have students writing and posting to this one blog. In this case, you need to give them editing permission but they do not have to make their own blog. This step stretches students’ responsibility a bit more as they become authors in the class blog. 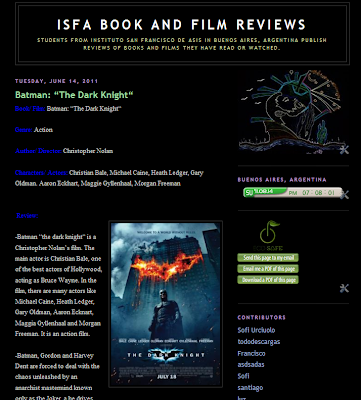 Have a look at this example of a blog I made for students to write film reviews. The last step is having students make their own blogs and manage them. You can guide the students’ postings or you can give them freedom to use the blog as an expressive platform for anything they want to write about. In this last step, you can benefit from using RSS to monitor your students’ blogs. Also, these are detailed step by step videos for using Blogger by Russell Stannard in his amazing Teacher Training Videos website. Hope you have found some useful ideas to get you started! If you have other ideas you are most welcome to share them in the comments. I know colleagues from my old school have gotten into homework blogging and I thought of the same idea but rather providing students with parental guidance a means to practice the taught vocabulary from my French classes. I have blogged (inconsistently) in the past on a personal level so I'm not new to the format. However, my main concern is hosting one. In the past I have had an account or two at blogger.com but I don't want to access a site that has non-educational stuff that vulnerable children can access. Is there a site that hosts blogs for educational purposes only? Thanks for such a great post on the subject btw!! I`ve had no problems with Blogger but you might try Edublogs and Kidblog for ad free platforms. Nowadays, I think teachers couldn't teach without technology in consequence of which Blogging is learning by sharing with each other, helping others learn, and keeping everyone connected even outside of school, college, university, or home. The benefits are so meaningful, students may edit, link, seek, comment, question, and socialize a lot with peers around the world. Thank you for sharing this info! I am a teacher developer from Argentina and I am about to start using blogs with my students at the Teacher Training College. I absolutely agree with you when you say teachers should try the tool first. I do find blogging very beneficial for my students, especially when they discover there is a real audience to read what they write! Familiarity with tech tools is essential to be able to cope with students questions and doubts when we introduce them in class. How will you be using blogs with your trainee teachers? My wife's sister is a middle school teacher, and she's been longing to form her own blog for her class in the past years, And just recently we hired a guy to build her website for her. I'll redirect her to your blog so she could learn it's not that complicated. Thank your for this simple explanation of using blogs in the classroom. I have just started teaching an ESL class and have been looking for ways to engage reluctant readers and writers. This just might be the ticket! @sap Thanks for the comment. Hope she can find a way to start blogging! Thanks for your comment. I wish this can be it! As for platforms, I have always used Blogger, but other effective ones are Wordpress, Edublogs, Posterous and Kidblog. Thank you for such a lovely & informative explanation. It would always be great experience to start blogging with students. Hi Vicky, I recently enrolled in an online course on Language and technology. One of the first assignments was to build a blog. There are tons of tutorials out there to create a blog and it seems to be very simple but Vicky, to be honest, blogging is not that simple. I am still a bit scared to publish my very first posts..I read a couple of your posts and felt quite comfortable at the end.Thank you my dear for turning a complicated task into a simple one!